85 years ago women in America were very modest when they went swimming on public beaches wearing one-piece swimsuits as pictured here. Amazingly, if any Muslim woman today were to wear this outrageously, sexual, sensual, revealing, inviting outfit she would be raped by strangers, stoned by relatives, and arrested by Islamic authorities. Reader Layla G. notes: "How sad that these women and men have no faith in one another to do the right thing that they must dictate to women how to dress. Well there goes trust out the window, but then there is no trust amongst Muslims–especially when it comes to the women." Breaking these customs has gotten at least one female Olympian into trouble. In 1992, Hassiba Boulmerka of Algeria was wearing contemporary running shorts when she won the 1,500-meter race. She was later denounced by critics at home for "running with naked legs in front of thousands of men." Still, would Boulmerka have won the gold if she had run the 1,500-meters dressed in traditional Islamic clothing? In most sports, Islamic robes and head scarves would make it impossible for an athlete to perform at her best. But I suppose it is better than the traditional hijab. At least the following swim and sports styles advance Muslim women from 722 A.D. to 1850 A.D.
Have you heard of Burkini? It’s a cross between Burqa and Bikini designed and made famous by an Australian designer, Aheda Zanetti, a Lebanese-born mother of four from Sydney. A mix of burqa and bikini, i.e. burqini has been designed for Muslim women lifeguards! It would be worn for the first time by the members of one of Australia’s most distinguished institutions — The Volunteer Lifesavers. According to the Sunday Telegraph, the idea of developing the modesty-saving swimsuit came almost 12 months after violent clashes between young white Australian men and Muslim teenagers on Sydney’s Cronulla beach. It is with some irony that I observe all the publicity going on in Australia about this new 'Burqini', is it really ground breaking? Or is it just Swimwear fashion from Victorian times revisited? A grant from the Australian government, to the tune of A$600,000 (£242,000), also helped [a group of Muslims become life guards]. So, too, did a local clothing designer, who designed a full-body Lycra swimsuit which let female life savers perform their duties while at the same time adhering to Islamic dress codes. With its own hijab, or head scarf, attached, the outfit has been dubbed the burqini. 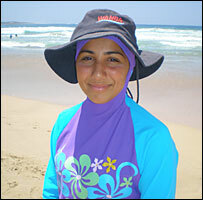 Student Mecca Laalaa, 20, who had never imagined becoming a surf life saver, wears it with great pride. I wonder if a male Aussie needs mouth to mouth, will Mecca be able to administer it? Or will she do what other Muslims have done, refusing to do their non-Muslim duty by obeying their Muslim duties in London, Austria, Australia, Minnesota, and Egypt? Rickets, Vitamin D and Sunlight; Britain, despite recent heatwaves, is not traditionally regarded as a sunny country. But it still has enough UVB radiation to provide the necessary vitamin D to keep the body healthy. As a result, most children and ambulatory adults get enough sunlight to create Vitamin D. During the Industrial Revolution, a disease became common, though its causes were then unknown. Many children were sent to work in factories, and hardly ever saw natural sunlight, and their diet rarely gave them enough vitamin D. Even when the children were allowed out, the high presence of smog reduced the amount of UVB light available.